Beautiful Himalayan salt lamps provide gentle warmth and balanced energy in the practice of feng shui. Himalayan crystal salt is a well-known natural ionizer and an excellent feng shui cure for good energy (and good air!) in your home. When the heat of the lamp's bulb warms the salt, the Himalayan salt lamp releases much-needed negative ions into the air. This cleans the air and creates healing and good energy in your home. The outside surface of the lamp stays cool to the touch, so there is no need to worry about hot surfaces. What Is a Salt Lamp and How Does It Work? Real Himalayan salt lamps have a soft color created by a high concentration of minerals in the salt. Salt lamps start out as a solid block of salt, which is then hollowed out to make room for a light bulb. When the light bulb is on, it creates heat that is necessary for the lamp to work properly. The light also creates a soothing glow. Allergens exist in the water vapor that is in the air of every room of your home. Salt is hygroscopic, which means that it attracts water from the air. When the lamp attracts the water, the allergens are also attracted and cling to the outside of the lamp. Eventually, the water is heated by the lamp and evaporates into the air, leaving behind the allergens. The same process causes the lamp to release negative ions into the air. This helps to counteract the effect of positive ions resulting from electromagnetic radiation. Positive ions are emitted by computers, cell phones, and other electronics and can have detrimental health effects, including fatigue and weakened immunity. Adding negative ions to the air also helps reduce static electricity. 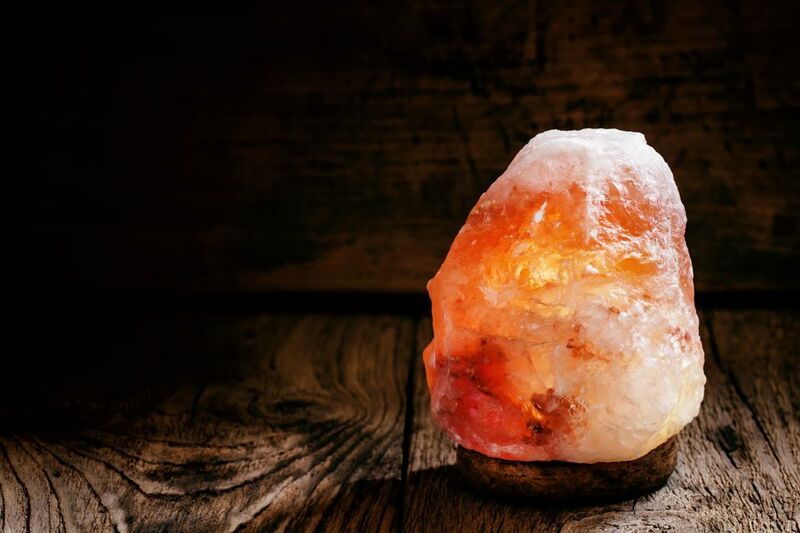 In addition to removing allergens and adding negative ions into the air, the warm and soothing glow of a Himalayan salt lamp speeds healing and is an excellent feng shui decor addition for cold winter months. The lamp's nurturing glow soothes many low-energy emotions that result from exposure to little light. Himalayan salt lamps are excellent feng shui for any room, especially for the bedroom, be it an adult's or a child's room. Salt lamps balance tight places and create pleasant surroundings. Many users of salt lamps have reported increased energy levels and improved quality of sleep. Small lamps — those that weigh less than 7 pounds — are best suited to a bedroom, while lamps that weigh 15 pounds or more are appropriate for a den or living room. The larger the salt lamp, the more area the lamp covers. The best locations for lamps are the areas where you spend the most time. To help with placement, lamps come in several colors — most in the yellow, orange, red, and pink range — but some salt lamps are white, brown, and purple. Himalayan salt lamps can also be used in conjunction with live plants to clean the air in your home.